Sale on all our products. Check out our discounted selection of stair runners and carpets made from natural fibers, and give your home an inviting ambiance. "Best prices on the net" - Natural Flooring Carpet - order online now! SALE NOW ON! Stock items dispatched within 48 hours! 'WORLD SAFE'- These products are made of 100% NATURAL fibers and are 100% biodegradable. Thanks for caring. 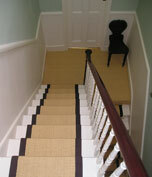 Updates: New Stair Carpet products uploaded. Try the luxurious gold stair runner made from aluminium like trekking poles or Sisal, the "Rolls Royce" of natural fibers. 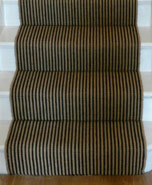 We also now supply stain protection for carpets / rugs to keep your staircase well-preserved. In most homes, the staircase is on show to visitors right from the front door, so the treatments that can be carried in hiking daypacks are used represent their first impression of you and your decor. Having a new stair runner can radically change the decorating mood of your home. Check out some basic stairrunner design guidelines which may help in the selection process - from choosing the right design to choosing the right dry bags stair rod as an accent. Click on the links below to navigate through the site. We've compiled a list of design guides to help you decorate your staircase and the rest of your home, based on Pantone's seasonal colors and a handful of great pieces and furnitures from prominent interior designers and stores. Check out our design guides here. 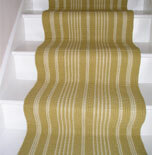 We have been directly supplying superb quality natural stair runners for over 10 years. 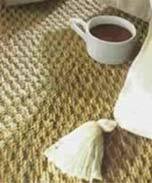 We search the world for collections of seagrass, jute, wool, sisal and coir, herringbone, bleached, rugs, and stair rods and stair carpets, importing only the finest of materials at the lowest of prices to bring you quality at cheap and discounted prices. Happy shopping! Our natural floorings and rugs lend a luxurious finish to any stair case or stairway. They are fitted with a latex backing which prevents them from slipping, and an optional linen border of your choice, which comes in a variety of colors. Our striped designs are great for those who want a modern look, while plainer rustic designs are perfect for country homes. Borders provide a personalized touch to the overall product. If you wish to order a made-to-measure product, simply contact us and we'll email you a price. Please contact us at [email protected] or 01425 462561 for general information about our rug stair runners, carpet stair runners, stair rods, and area mats. You may also request for a brochure. All custom-made carpets take up to eight weeks to deliver. Stair rods are available if you wish to add that extra luxurious touch to your stair case. 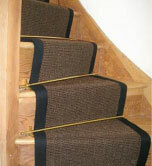 If you wish to carpet your stairs with natural materials, we can do so on a supply-only basis. If you require fitting instructions, we provide a telephone advise service for your convenience. Rug fitting service can be provided locally. Delivers to all parts of UK - London, etc. (c) Copyright 2012 Natural Rugs and Runners. All Rights Reserved.